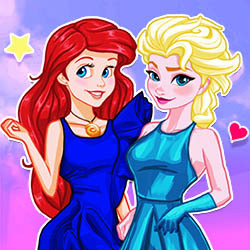 Description: The Cover Girl Princesses are ready for a real makeover! They need you to apply a special beauty treatment to their face, cover up any redness and cleanse the face. Next, it's time for make up! Choose the best colors to make their eyes and lips pop. Apply contouring and blush and they'll be ready for their photos! Finally, pick out the best high fashion dresses for the magazine covers and also decide on the texts that will feature on the cover alongside the princesses!